Happy New Year! Thanks to Amy Saletta, Vicki Steevensz and everyone else involved in planning our lovely holiday party in December. 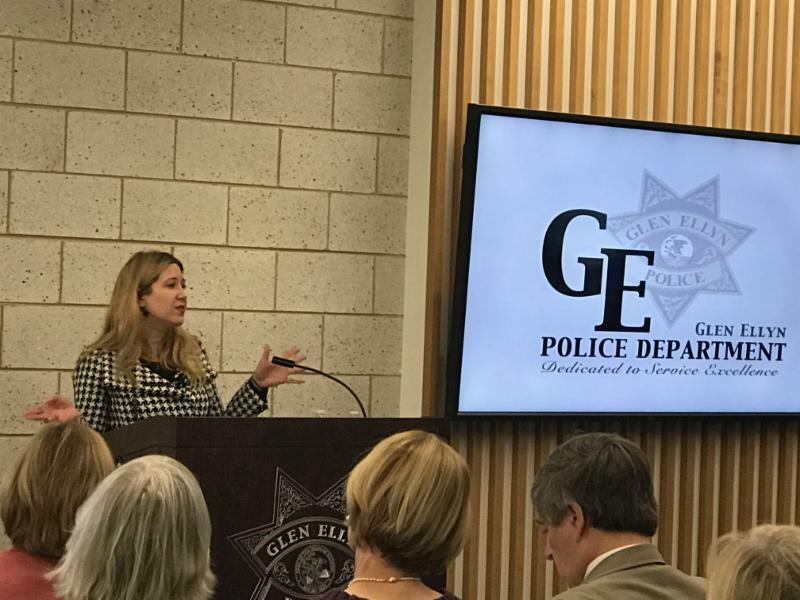 State of the Village – On January 17, Diane McGinley, Village Board President, discussed the state of Glen Ellyn at our community meeting. If you were unable to attend, watch our Facebook page for the videotape of the meeting, facebook.com/LWVGE. Program Planning – Our annual planning meeting is on Saturday, February 2 from 8:30 a.m. to noon at Brookdale at 60 Nicoll Avenue. Review the materials included in this Voter to prepare and bring ideas for action items/upcoming programs. Please come even if this feels overwhelming. 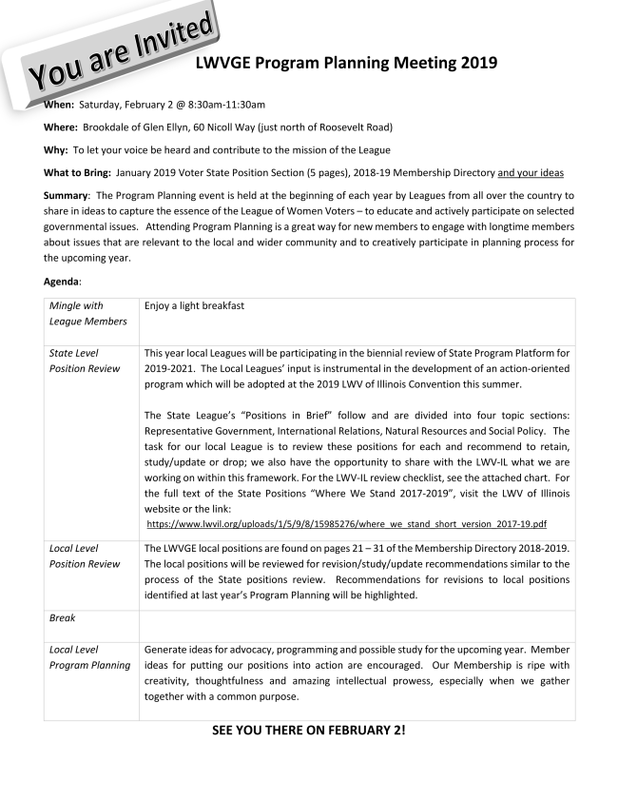 This is a great chance to learn more about our League positions that influence the decisions we make and the letters we write to local editors. Congressman Casten Community Meeting with LWV/Wheaton on February 21 in the evening at Cantigny at 7 p.m. Candidate Forum for School, College of DuPage and Park Boards – March 16 beginning at 8 a.m. at the Glen Ellyn Police Station. Julie Nolan is chairing our Nominating Committee for the 2019-20 Board. If you want to join or suggest a strong addition to the Board, contact her at southie398@aol.com . Always check www.lwvge.org or Facebook for the latest updates. Please join us for Book Club on February 9 at 9 a.m. at Michelle Peterson’s 579 Riford. 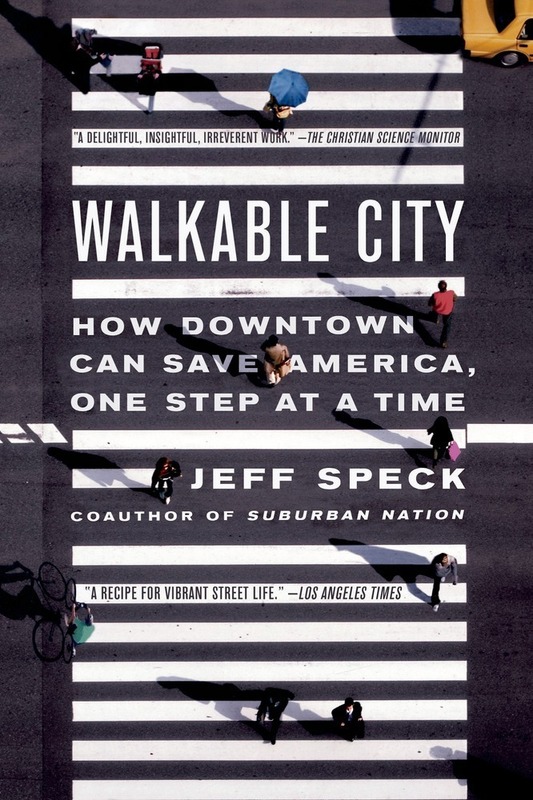 Walkable City: How Downtown Can Save America One Step at a Time by Jeff Speck. Books are reserved at the Glen Ellyn Library. 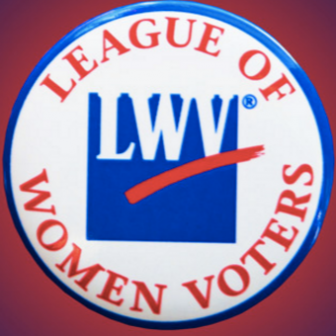 LWVGE will host a Candidate Forum for candidates running in the April 2 election including those running for Glen Ellyn Park District Board, District 41 School Board, COD Board and District 87 School Board. Watch lwvge.org for exact date and location. 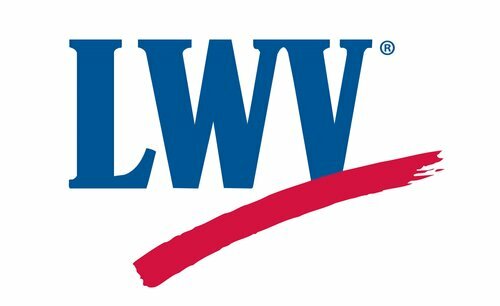 In 2018 LWVGE registrars did a terrific job registering or updating current registrations for approximately 150 voters prior to the November election. In addition they provided education about online registration which is an easy alternative to the paper application. 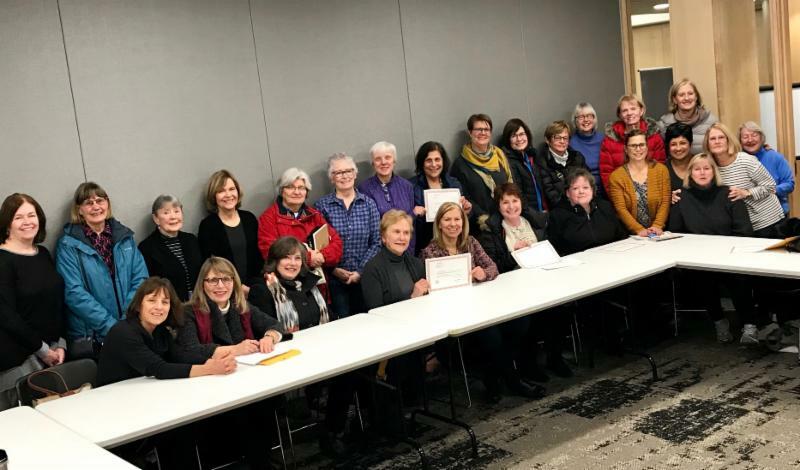 Twenty nine League registrars including eight new registrars were trained and sworn in on January 10 at the Glen Ellyn Library. These registrars are now certified to take registrations in Illinois until November 30, 2020. Congratulations! This is an important service that League provides. ﻿On September 25, National Voter Registration Day, 865,000 new or updated voter registrations were recorded nationwide. 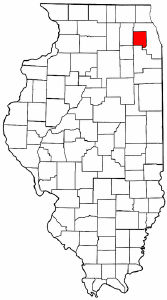 In Illinois, 7,771 registrations were taken in the field, but 21,291 registrations were done online. The League of Women Voters has been the single largest on-the-ground partner since the holiday’s founding in 2012. In 2018, 400 chapters in 47 states participated and mobilized 4,318 volunteers. In total, Leagues helped 32,376 people register to vote. Save the Date: Saturday, March 2, from 9:30 a.m. - 4 p.m. This annual event is sponsored by the Illinois League. Please watch their website lwvil.org for more details. The Glen Ellyn League will cover the registration fees of 4 new members (since 2018) who want to attend. Please contact Judy Kinn at jwkinnsm@wideopenwest.com if you are interested in attending. The League’s Observer Corp functions as the eyes and ears of the league, observing public meetings and reporting back to its members. If you are interested in becoming a member of our Observer Corp or would like more information regarding the duties, please contact Carrie Burrows at carrieb131@gmail.com or call me at 630-263-9245. Our goal is to have all public bodies covered and you can help make this happen! 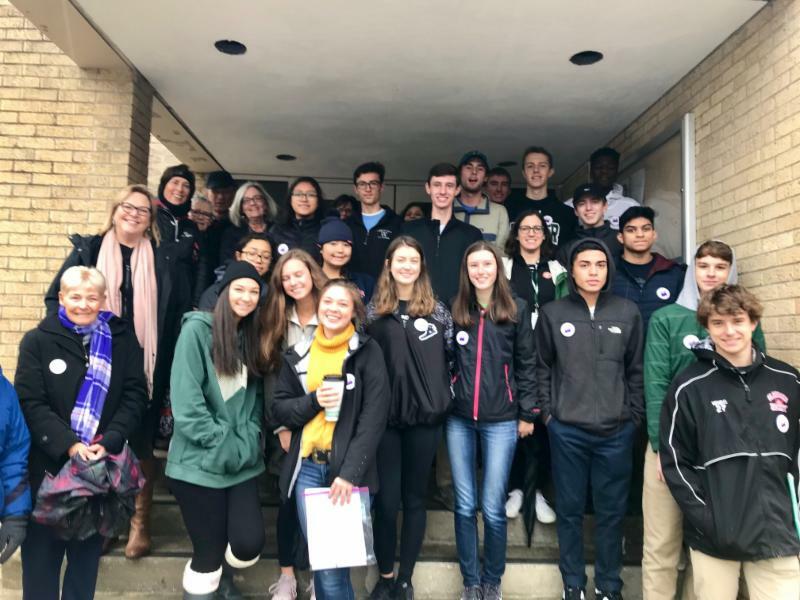 Erica Nelson, along with eight League members, Molly McNally (a Glenbard West teacher) and 18 Glenbard West students, spent two hours canvassing low turn-out neighborhoods in an effort to increase voter activity in November. WTTW's Amanda Vinicky spoke to our group within days of the November election. We saw a full house at this important "Election Debrief" on November 11. Doing what LWVGE does best: About 30 voter registrars were trained and sworn in at the GE Public Library on January 10th. Making Democracy Work! 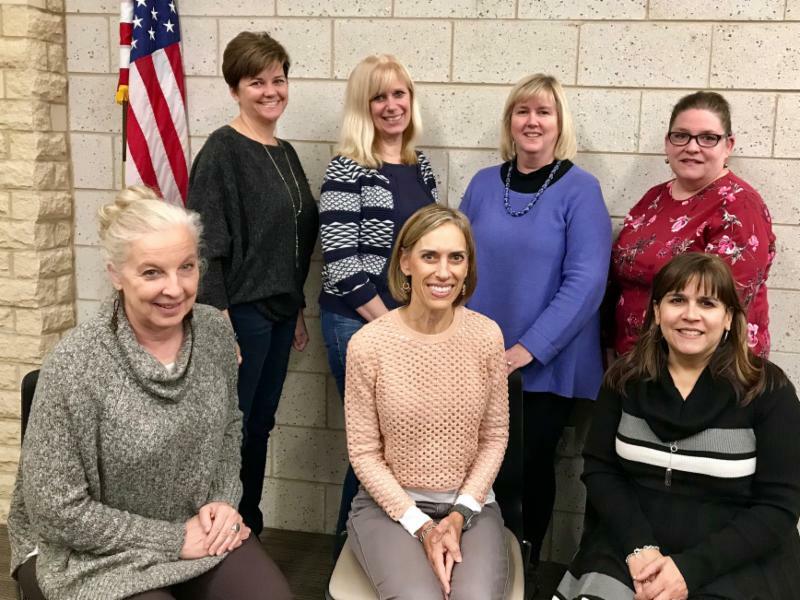 Last May we were thrilled to welcome seven newer members to serve their first terms on the LWVGE Board: (Seated: L to R) Alix Darrow, Terri Gorski, Rita Brosnan, (Standing: L to R) Jennifer Larrabee, Candy Purdom, Amy Saletta and Jodi Baltimore. If you want to learn more about the Board or suggest someone who should join the Board this May, contact Julie Nolan (the Nominating Committee Chair) at Southie398@aol.com . We're so pleased to have grown by 30 new members over this past year. Each makes our group stronger and helps share our message of involved citizenship to our greater community and world. Welcome all! March 21: Community Meeting on Women's Empowerment, 7 p.m.
May 2: Annual Meeting at Glen Oak Country Club, 6:15 p.m.